September 13th in WordPress Themes by Wordpress Jedi . Plenty of people are passionate about food and new recipes. If you love coming up with your own recipes, there is no reason you shouldn’t start your own recipe website. We have already covered plenty of themes and plugins that let you share your recipes with the world. Bacon lets you take the idea to the next level by allowing your visitors to submits their own recipes. Bacon supports Facebook, Twitter, and Google+ logins. 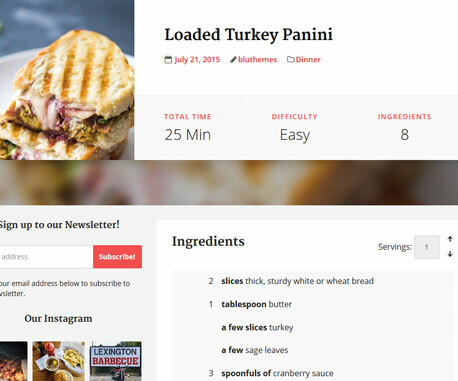 It lets your visitors submit their own recipes and “heart” existing posts. Once a recipe is submitted, you get an e-mail to approve it. Users will be able to see submitted and loved posts on their profile page. Bacon features a simple recipe calculator as well. Bacon lets you build a social recipe site to share your own and other people’s recipes with the world. This is a commercial theme by an Elite developer.